I had a quick stop in Qatar on my way to Nairobi. It was only an afternoon and one night, but it was pretty much enough time to see everything in Doha. Like Abu Dhabi and Dubai, Doha is undergoing a massive building boom, constructing a modern skyline from scratch in less than five years. 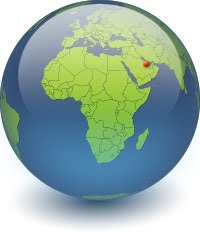 However, the city is smaller and more manageable than those cities in the U.A.E. My CouchSurfing host, Hin-Yeong (from Singapore) was generous enough to pick me up from the airport, and he showed me all around Doha. First we visited the new Museum of Islamic Art, a modern masterpiece designed by I. M. Pei, and then we walked along the corniche, which wraps around Doha Bay and has fantastic views over the sparkling water to downtown. There was a park nestled below the modern skyscrapers, which was bustling with picnickers since it was the weekend. In the evening, we drove to Souk Waqif, which is a restored traditional Arab market. It is very picturesque, if a bit touristy. However, most of the people milling about were locals. There was a large area of the souk that sold rabbits, cats, and birds; an area devoted to falconry, a popular past-time in the Gulf states; and many restaurants specializing in cuisines ranging from Iranian to Iraqi to Lebanese. We settled on an atmospheric Moroccan restaurant, where I had a traditional dish of camel meat with Moroccan spices. It tasted like lamb or beef, but fattier. We walked around the souk a bit more after dinner, soaking in the exotic ambiance of colorful shops packed with Moroccan lamps and shisha pipes, before heading back to Hin-Yeong's apartment so I could rest for my early flight to Nairobi.